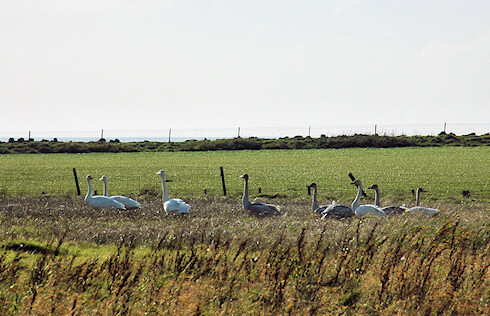 From what I understand (if you know better please correct me) Whooper Swans don't winter on Islay, they just pass through at this time of year. They arrive from Iceland, rest on Islay for a day or two and then move on. If I remember correctly to the north of England. Sometimes they arrive in large groups of several dozen birds (on the same day this picture was taken a group of 59 was seen at Gruinart. Groups of over a 100 birds have also been reported), sometimes in smaller groups like this one. This picture was taken on a field between Kilchoman and Coull Farm, if you look closely you can just make a bit of Machir Bay on the horizon.